I am more accustomed to writing about Country singers or songwriters who have come from New York City to live in Nashville. 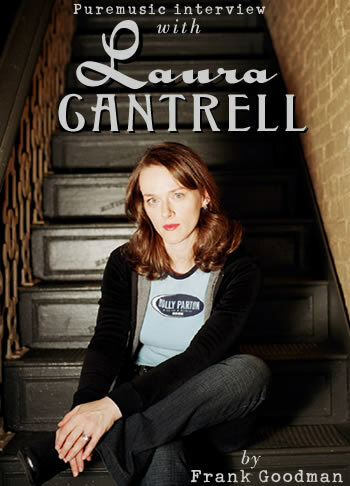 Laura Cantrell is singular in many ways, but certainly in the respect that she was born in Nashville and is a great Country singer living for quite a few years in or around New York City. Laura Cantrell's partner in crime is her husband Jeremy Tepper, the founder of Diesel Only Records, her original label before she leapt to Matador on her new disc Humming By The Flowered Vine. Jeremy is himself a musician and a fine writer, having co-authored one of my favorite Jim Lauderdale tunes, "Diesel, Diesel, Diesel." His label specializes in truck driving songs of many varieties, but also includes recordings by the likes of Joe Flood, Amy Allison, Mojo Nixon, and tasty others. With lawyers for parents, perhaps it's natural that this country siren went to Columbia and rose to corporate VP in a Wall Street investment firm, though it's a humorously enviable pedigree for a singer in this day and age. Consider how difficult it must be to walk away from that security, as Cantrell has with this latest record, and become a full time artist. With all she has accomplished as a part time artist, and with the AAA and college radio push by Matador Records, it will be very interesting to follow her trajectory.